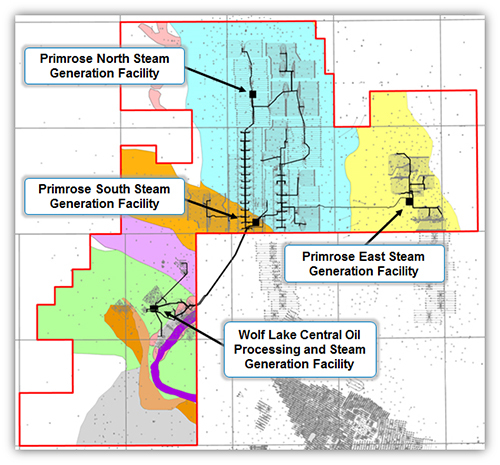 In the Cold Lake deposits, our Primrose operations currently produce from the Clearwater reservoir using the cyclic steam stimulation (CSS) process. CSS uses a single well bore to inject and produce steam. This technology has been historically applied to reservoirs that have barriers to vertical flow. The production peaks and troughs at Primrose are a reflection of the cyclic steam process – the peaks are associated with production cycles from newer, less mature wells and the troughs are associated with production cycles from the more mature areas in the field. Subsequent to several cycles of CSS production, the Clearwater reservoir is well structured for the steamflood follow-up process. Steamflood utilizes existing production wells as low pressure steam injection sites, with existing producing wells pumping heavy crude oil to the surface, similar to SAGD. The Company targets to deploy this technology throughout its mature CSS wells at the Company’s Primrose operations.